Like many of its Rust Belt peers, the Detroit region and the State of Michigan are at a crossroads. Both the region and the State are suffering from declining economic standing and growing inequality, at a time when human capital is critical to invigorating stale Rust Belt economies. This critical crossroad represents an opportunity to address the longstanding inequities plaguing and degrading the vitality of the Detroit region and the State of Michigan. Battered by challenging economic conditions, a national housing crisis and the continued decline of the once-robust manufacturing sector, the region and State must find innovative ways to capitalize on its assets and redirect its course to be competitive in the 21st century. A significant impediment to reinvigorating the State is the widespread and systemic inequity plaguing marginalized populations and communities. For Michigan’s communities of color in urban areas, this marginalization is extremely pronounced, with many of the State’s African American communities isolated from the essential opportunity structures needed to succeed and thrive in the 21st century global society. All Michigan residents share a linked fate and common future. 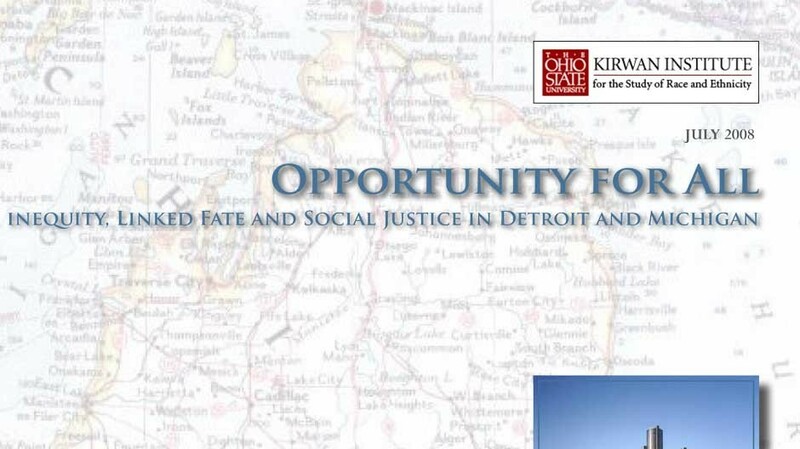 This paper looks at the connection between inequity and declining economic vitality, a connection which should raise alarms across the entire State. A significant source of Michigan’s inequity is rooted in housing disparity and racial segregation into distressed (or “low opportunity”) communities. In response, we advocate for a “Communities of Opportunity” model of social justice.